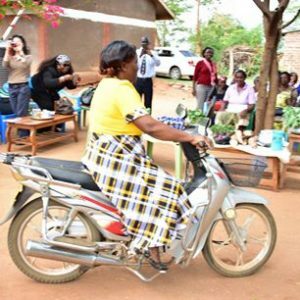 “My name is Angelina Kavithe Francis a married mother of 5, and a member of Tamika Horticulture Women group in Kitui Rural Sub-County in Kitui County. All my life, I had relied on rainfall to cultivate maize on my farm. Each year, productivity in my farm deteriorated due to utilization of recycled seeds, pests and diseases; this prompted me to engage in casual labour as a way of supplementing my income. Because of this, my husband and I struggled to pay school fees for our 2 children in secondary schools which led to accumulation of debts. I joined the GROOTS Kenya movement in 2013 during the community led mapping that was conducted to identify grassroots women farmers to participate in the “Accelerating Rural women’s Access to Agricultural Markets and Trade’ project. Together with the other women farmers, I learnt dry land farming practices, record keeping, farm planning and poultry management following trainings organized by GROOTS Kenya and conducted by sector experts drawn from South Eastern Kenya University and the Ministry of Agriculture. We formed the group and registered it officially. We then started table banking and each of the group members began to borrow small amounts of money which we used on our farms. I borrowed my first Ksh.2000 which I used to buy green grams, kales and tomatoes for planting. From this, I got Ksh.7000 after harvesting. I borrowed another loan worth Ksh.5000 and used this to expand my farming. Later that year, I borrowed Ksh.50,000 from the Lead Entrepreneurs Fund that was set up by GROOTS Kenya at Equity Bank. I used this money to buy a generator worth Ksh.15,000 and pipes. With a constant supply of water, I planted 1 acre of water melons and I got a tender to supply these melons at South Eastern Kenya University. I made a profit of Ksh.60,000 from this. I was able to repay the loan in five months’ time. I borrowed another loan worth Ksh. 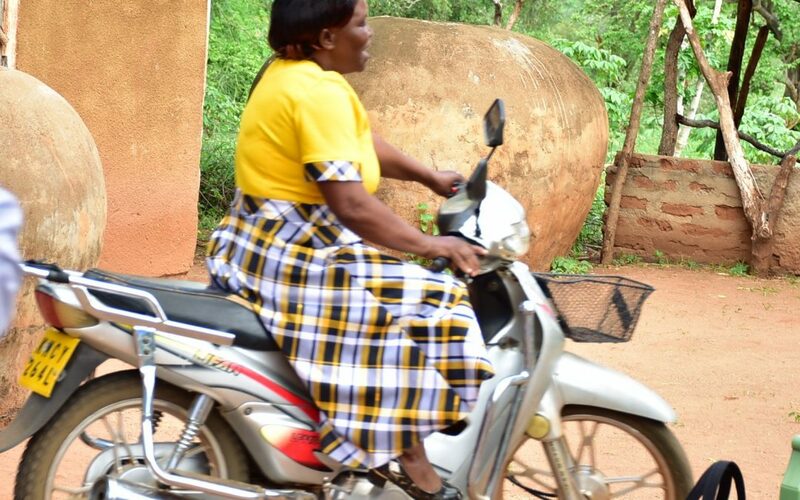 100,000 and bought a motorbike to help me ferry my produce to the market. In addition to water melons, I planted more kales and tomatoes. I got into chicken production and I currently have a stock of 200 birds. I sell the birds at Ksh. 350 per kilo. Each month, I started producing 10 bags of Sukuma wiki, 8 crates of tomatoes and 2 trays of eggs; these would generate an income of Ksh.28,000. I repaid the Ksh.100,000 in 10 months and took another loan worth Ksh.200,000. I used this to purchase a ¾ acre piece of land whose title deed is in my name as was proposed by my husband. I also increased the acreage under production to the whole 2½ acres of land where I now plant a variety of crops. My standard of life improved considerably and we were able to move our children to better schools where they can now access quality education. Five of my neighbours have also adopted improved farming technologies from my farm and have already started to experience increased income levels. I have grown in my leadership too, I am the treasurer of Tamika horticulture women group and I coordinate the four GROOTS Kenya groups in Kwa Vonza location. I am grateful that I crossed paths with GROOTS Kenya because at that point, my life changed completely. I am now financially stable, my husband and I are happy, my children are enjoying a better quality of life and I will never slide back into poverty for as long as I live. These days, when my husband comes home with a loaf of bread and half a kilo of sugar, I bring home a loaf of bread and a kilo of sugar, and life moves on.